Many employers and companies promote the concept of work life balance that is built into enterprise agreements and mission statements for companies. It is a big issue for many companies that aim to maintain good relationship with their employees. Unfortunate in real life this is that is fundamentally a lie and a myth. Something has to give - if you have a family or want to pursue a life beyond your job, then you will always have to make compromises and one side or other will inevitably suffer, probably both. You can't win, You can't sustain a perfect balance. If you choose to put family or life on an equal footing to your job your career will suffer. This is not a bad thing - but its your choice - you need to be aware of the outcomes. Your company, employer and your boss will always expect 100% devotion to work despite what you are told. Your colleagues, who don't have family or life beyond work commitments will be likely to be able to beat for the plumb jobs and career progression. However the situation is not hopeless and there are many things you can do to minimize the damage and find ways to minimize the damage cased by a family or life beyond work on your career. Likewise there are many things you can do to minimize the impact of work on your family and life. Many highly successful, high profile business executives have managed to find a successful compromise and in this article I will explore many of the tips that have worked for many people. Steve Job's neighbor, Lisen Stromberg said what interviewed that Steve Jobs could switch off work and switch on family and become just the 'guy who lives down the street'. She spoke about being greeted by Steve with his children on Halloween, dressed up as Frankenstein. She remembers seeing Steve at her son's high school graduation with a wide smile on his face, so proud, with tears streaming down his cheeks. However, research from WP Carey School of Business at Arizona State University shows that people who choose flexitime and part-time options are likely to have a disadvantage in the workplace. (see 'Flexibility's price tag: gain time, lose career footing' ). According to one study, 70 % of men who resigned from public accounting firms cited work-life balance as the reason for leaving, potentially hampering their careers. Other surveys have shown that flextime and part-time employees generally were given lower scores on their desirability as teammates and managers said that these type of employees would be assigned less challenging work in the future. Flexitime is a system where an employee can have flexible hours to allow for time with the family. Some people start very early in their day so that they can pick up their kids from school and be involved in all sorts of after School activities. The reality is that the bosses mostly start very late in the morning and many important things happen late in the day when you are no there. Research has shown that this affects people's career prospects. In many instances, despite stated support these people are seen as not pulling their weight and not being here when you need them. 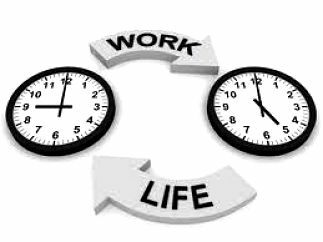 Work-Life Balance Defined - What is it in Reality! 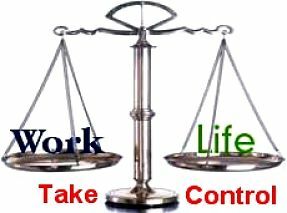 Work-Life Balance does not necessarily mean an equal balance - you choose what matters. Trying to schedule an exactly equal number of hours for each of your personal activities and work tasks is usually unrewarding and unrealistic. Life is much more variable than that. Make work part of your life not a conflicting demand. Your personal work-life balance will naturally change, often on a daily basis, but certainly dependent on your age and various life-beyond-work commitments. Your best balance now will probably be different for you next week, next month and next year. Your right balance will be different when you are young and single, when you start a new job, when you marry or have a permanent partner, when you have children and need to support your grandchildren and when you are nearing retirement. There is no ideal, one-size fits all, balance you should be targeting. You need to be flexible and adaptable and set your priorities. Be realistic. The key objectives for any work-life balance strategy are Achievement, Fulfillment and Enjoyment, and these aims help you to always ask the right set of questions that begin with: 'Why?'. Why do you want a better income? Why do you want or need new house? Why do you want your kids to go to college and what do you need to do to make this possible? Why do you want to do a good job with your daily tasks? Why is job satisfaction important? Why do you want to be promoted? However man of these objectives may not include the concept of Enjoyment, which means maintaining a sense of Well Being and harvesting the Joys of Living. It include means Pride, Celebration, Satisfaction, Happiness, Fulfillment, Love, and being Satisfied. Achievement and Enjoyment are on opposite sides of the life balance equation or on opposite sides of a coin. You need both, and they are dependent on each other. But balance is critical, otherwise you will have one-sided and frustrated life. Many outwardly 'successful' people are not happy because they live one-sided out of balance lives. Focusing on balancing Enjoyment and Achievement every day in life helps you avoid trap of the 'Half-Life' where you continually put things off with "as soon as" excuses. Don't postpone the joys of life, don't postpone the work commitment with any "as soon as…." excuses. You can plan much more effective than that and this is what the life-work balance is all about. => Family, Work, Friends and Self. When was the last time you Enjoyed AND Achieved something at work? What have you enjoyed and achieved with your friends? What have you Enjoyed AND Achieved just for you? 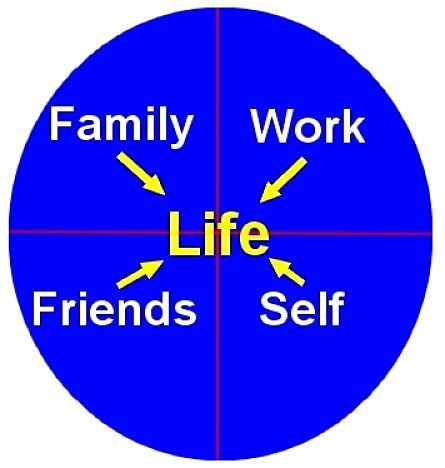 Good life-work balance means trying to meet these requirements in a balanced way every day and every week with complete commitment to them so that they don't become 'Half-done' or Half-enjoyed things' with no 'as soon as...' postponements. A balanced life requires a fabulous and effective planning and scheduling system so that you can fit everything in without interferences and competition. You need to be in charge of your life and in total control to get the right balance. Employers and employees are continually regularly struggling to achieve the right balance. Embrace work and life as one and the same. Determine what is appropriate for each individual situation. It is not a simple matter of assigning 'Time for the Family', 'Time for Friends', 'Time for Self'. Its more complicated than that as you need satisfaction and achievement for all the components and you need to deliver them in a balanced schedule. The concept of work-life balance is further complicated by the fact that the workforce is culturally diverse and consists of a mix of various generations, each with its own set of priorities and beyond-work commitments. There are major generation differences: Generation X is entering the mid-career phases; Baby boomers considering second careers or retirement; Generating Y are just starting out in the workforce. The varying requirements of various types of people at different stages of their lives can be addressed through understanding what they need and applying technology, flexible scheduling, developing team-based approaches, mentoring programs and flexible and adaptive management styles. Regardless of their generation, all the employees are trying to strike a balance. It should not be a battle between life and work. Work is life. Life is work. Everyone will have their own equations to achieve the balance and this is likely to change frequently. For any task or activity devote complete concentration to that task or activity, excluding all others. Focus completely and absolutely on Work, Family Life, Friends and other components when you are engaged in these activities. Don't let thoughts about work interfere with your time with your family friends and vice versa. Sure there are emergencies and times when you need to be contacted at home but try to always practice exclusive scheduling. Set manageable goals each day. Being able to meet priorities helps us feel a sense of accomplishment and control. The latest research shows that the more control we have over our work, the less stressed we get. So be realistic about workloads and deadlines. Be efficient with your time at work. So when you face a big project at work or home, start by dividing it into smaller tasks. Complete the first one before moving on to the next. If you feel overwhelmed by routines that seem unnecessary, tell your boss. The less time you spend doing busy work or procrastinating, the more time you can spend productively, or with friends or family. Ask for flexibility but define schedules and stick with them. Jim always has Wednesday afternoon off for the family. Research shows that employees who work flexible schedules are more productive and loyal to their employers. Communicate effectively. Be honest with colleagues or your boss about how the job is going and your work schedules. Don't over commit. Do you feel stressed when you just glance at your calendar? If you're over-scheduled with activities, learn to say," No." Shed the superman/superwoman urge! • Get support. Chatting with friends and family can be important to your success at home - or at work - and can even improve your health. People with stronger support systems have more aggressive immune responses to illnesses than those who lack such support. Stay active. Aside from its well-known physical benefits, regular exercise reduces stress, depression and anxiety, and enables people to better cope with adversity, according to researchers. It will also boost your immune system and keep you out of the doctor's office. Make time in your schedule for the gym or to take a walk during lunch—and have some fun! Use modern technology and various apps and programs to get organised and make things easier for yourself. Do everything online. Focus on end results and avoid spending too much time procrastinating over details that don't matter. Prioritize ruthlessly - Know what's important and what can wait. Keep a list with 5-10 things on the list in priority order. If a new activity develops, decide what item on the list it will have to replace. Avoid building long daily list. Organize - Big Time by scheduling your time and getting yourself, your home and your office well organised. Clutter wastes time. Accept a Standard that is Excellent but not Perfect - Perfection can seldom if ever be achieved especially in a restricted amount of time. Maintain reasonable standards and learn what matters and what doesn't. Use your time commuting to plan ahead or unwind. Leave Work stress at Work - Home Stress at Home - Learn to Switch Off - The worst thing you can do is to burden your family or friends with your job frustrations. Likewise when at work you don't want to be burdened with home troubles. When at home don't think or worry about work. Only start thinking about business when get into your car or bus. The moment you enter your home, switch off from work. Maintain boundaries between Work and Home. Put a time gap between work and home, such as going to the gym or doing various errands. This will help you switch off and put you in a better frame of mind. Re-Assess your activities and purge the excess - ruthlessly eliminate commitments that are not meaningful or important and learn to do things quickly and effectively within the allotted time. Live an interesting life - Challenge yourself to get involved in adverse range of interesting activities that you can look forward to. This contributes to your mental well being. 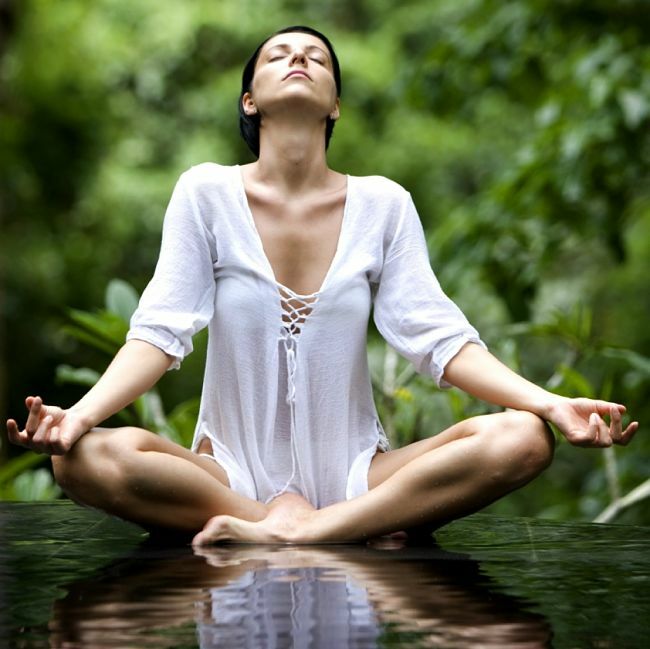 This will make you more satisfied and more relaxed and able to cope. Get more Fulfillment From Work - you spend a lot of time and effort at work so make sure its enjoyable, fulfilling and full of achievements. The more you are in control the better you will react to work challenges and feel a sense of achievement. Improve Relationships With Family and Friends - According to psychologists about 85 % of your happiness in life depends on your personal relationships. The other 15 % of your happiness comes from your achievements. So adjust your priorities accordingly. Have a well Developed Schedule and Stick to it - This is the key to maintaining the right balance. Allow time for exercises or yoga as well as family and work. If your day is well-structured it makes it all manageable and fulfilling. Delegate and Prioritise at Work AND at Home. You don't need to do it all yourself.There are many benefits for sharing and delegating.